RR065125. 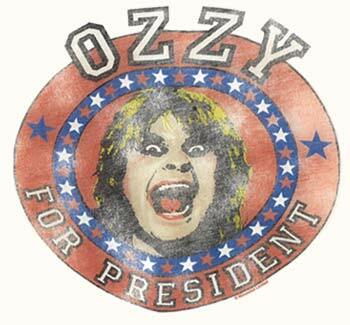 Sure to get laughs - this Junk Food brand shirt reads "Ozzy for President". Printing is intentionally "weathered" to give it a vintage look. Printed on a very soft and slightly stretchy 50/50 cotton/polyester blend white tee. Shirt measurement across the front if laid flat and measured under the arms: Sm-14, Lg-16". Length from back collar to hem: Sm-21", Lg-23". Ladies Junior sizes Small and Large left in stock.